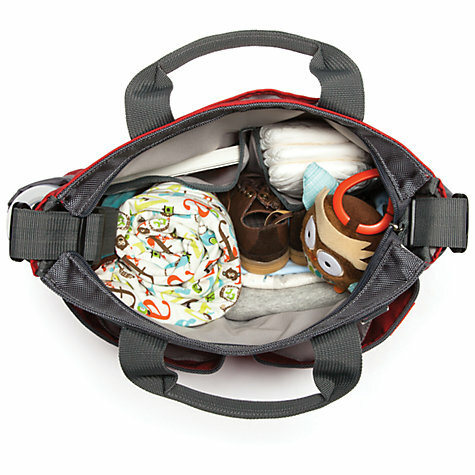 A diaper bag lets you keep all your baby essentials in one place when you you're out and about so that you don't have to go into a frenzy when baby is hungry, or if there is a diaper accident. 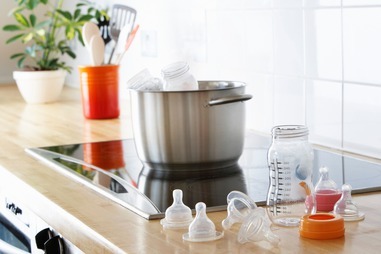 To name a few, you will certainly need to pack a baby bottle, baby powder (or breastmilk storage bag), a set of clothes for changing and last but not least, a few diapers. 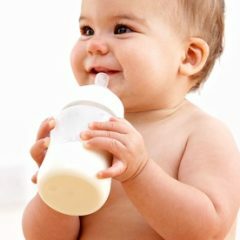 For some, a changing pad is a must and for those that are breastfeeding, you will most likely need to pack your breastpump, too. Here are some of the best Black Friday and Cyber Monday sale bargains the market has to offer this year! There really isn't a distinction between girls and boys diaper bags, however, there seems to be an apparent difference, among parents, when it comes to selecting a diaper bag for different gender. You can definitely choose one based on your preference and practicality, nonetheless, let's now see what are some of the popular baby bags for girl. 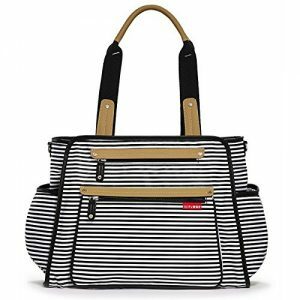 The Skip Hop Duo Signature Carry All Diaper Bag probably needs no introduction. One of the brand's most popular and bestseller design, this is a favourite diaper bag for girls (and boys, really!) among many parents. With 10 pockets , you have plenty of compartments to categorise your essentials in a neat and tidy way and the 2 elasticised, mesh side pockets fit most sized bottles. 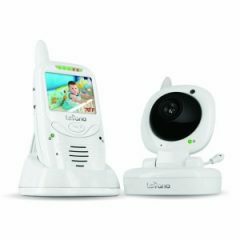 We think it is a pretty good size to hold basically all that you need for a 12 month to 4 year old, and it can fit tablets and laptops of up to 15 inches. This updated version takes note of all parents' feedback and has now included a new zip-top closure to ensure all your belongings stay securely in the bag. Tote handles are added for versatility so that you can switch between the adjustable shoulder strap and grab handles. And there is now a "tech pocket" for you to put your gadgets (phone, tablets etc.) for easier accessibility. The new front panel design allows for more storage and stability while keeping items at the bottom of the bag more easily accessible. 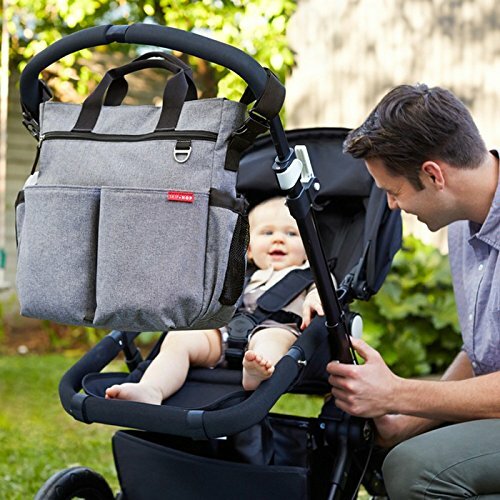 Don't worry, the Duo Signature still has all the classic components of the original, including the brand's patented shuttle clips that converts easily to a stroller bag. 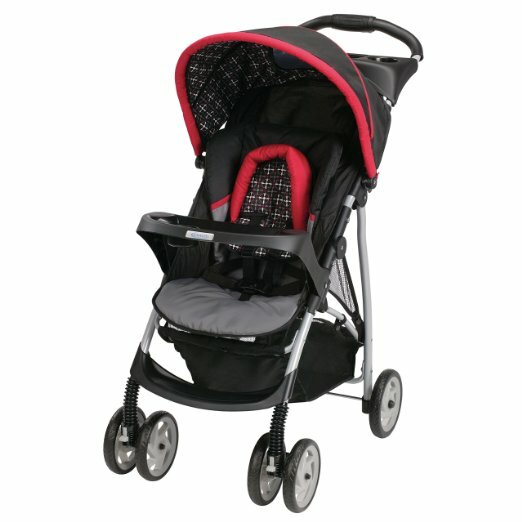 Its easy attachment to most strollers is after all, one of its biggest selling point! 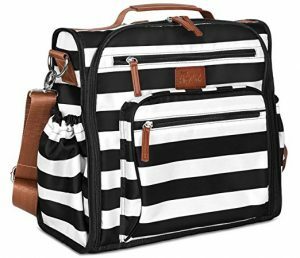 The Skip Hop Duo Signature Diaper Bag is so popular, there are many imitations in the market so do be aware to buy from a trusted vendor if you want an authentic one. And oh, each Duo Signature comes with a portable cushioned changing pad too so you can change your little one anytime, anywhere. Perhaps the biggest dread when it comes to diaper bags is the fear that it will really look like a, well, diaper bag - you know, dowdy and dated. 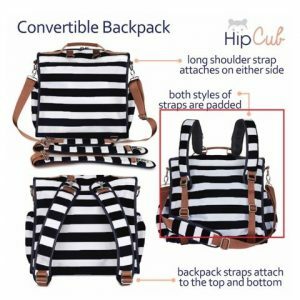 Hip Cub recognises this fear (pardon our exaggeration) and has come up with the stunning Convertible Diaper Bag Backpack that will certainly fit any criteria of cute diaper bags for moms! Sometimes we are fickle minded - we want a tote bag that we can carry, but sometimes we'd prefer to sling it over our shoulder. When it comes to emergencies, we wish to have a backpack so that both hands can be free to manage baby. This diaper bag allows you to do just that - it effortlessly converts from a traditional cross body messenger or an over the shoulder tote, to a super cute backpack diaper bag. If you think backpacks are generally too masculine, this will change your mind - we think it is the backpack diaper bag for girl. For quick carrying, the top handle lets you do that conveniently as a tote bag too! In terms of functionality, it has 10 secure pockets - 2 front zipper compartments (one large and one small), 5 spacious interior compartments, 1 back pocket sleeve that is a perfect fit with a matching changing mat and 2 elasticised side bottle pockets. Every item will have its own space, you don't have any excuse for messiness anymore, really. 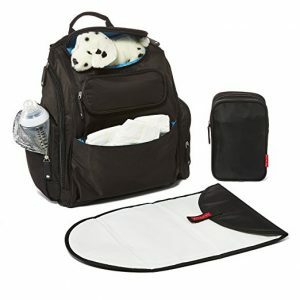 It also includes a complementary set of universal stroller straps as well as a matching portable changing mat. 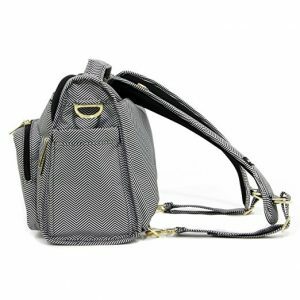 Truly value for money, its workmanship and design feel more like a top designer fashion purse than a diaper bag. As one of the most sought after cute diaper bags for girls, you will never have to sacrifice style over practicality with the Hip Cub Convertible Diaper Bag. 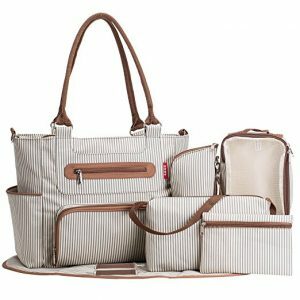 And with a 90-day manufacturer warranty, you can be sure this is one diaper bag of high quality. The SoHo Diaper Bag Grand Central Station is the perfect choice for those seeking for cheap baby bags. Just because of its very friendly price point, don't think style and quality are compromised - it is one of the most value-for-money find in the market! Why do we say so? Well, aside from the diaper bag, it also comes with 6 extra pieces of accessories. Yes, you get 7 pieces altogether in one price! 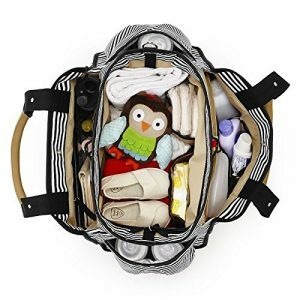 It includes 1 matching padded changing station, 2 accessory cases (for smaller items), 1 insulated zippered bottle bag (that fits most size bottles), 1 pair of Grips strollers attachments and last but not least, 1 personal small purse with zip closure and carrying strap for mom on the go. Back to the main feature - the diaper bag. First of all, it opens up wide so that you can access any item without hassle, in addition to being able to see all items at all times. The extra roomy main compartment has multiple pockets front, back and sides so that you can pack the most important things (bottles, wipes etc) for easy reach. 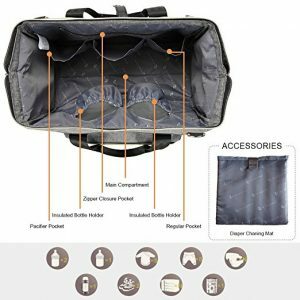 Overall, if you are looking for cheap diaper bags that are durable and in good quality, the SoHo Diaper Bag Grand Central Station will certainly not disappoint. Now, onto the diaper bags for boys. It seems that the general preference leans towards more basic colours and in backpack style (which explains why they are the popular diaper bags for dads) so without further ado, let's see what are some of the best choices out there! The Ruvalino Diaper Bag is perhaps the most undisguised diaper bag in the market - if we didn't say it was, would you have suspected it is a bag for baby stuff? 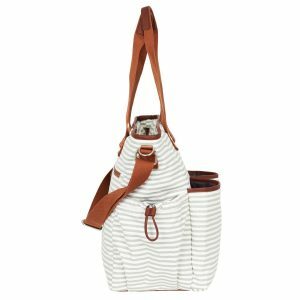 This sporty looking bag provides three ways of carrying - diaper tote, cross body diaper bag or shoulder carry. It is made of lightweight but strong material with the seams reinforced in the shoulder straps and handle so you don't need to worry about any ripping. The exterior canvas is super easy to spot clean and the interior is a wipeable polyester. due to a collapsible metal frame design that keeps the shape for easy search, and the rectangular bottom makes it sit upright very well so you can still reach for your stuffs even if you lay it on the floor. To better support your journey, the Ruvalino Diaper Bag has Smart Travel Solutions, which you can easily fasten to your suitcase while traveling as that pictured. Likewise, you can strap it to your stroller in the same way as well without worrying it will fall off. And when your baby finally outgrows the need of one, you will still be able to use the Ruvalino as a fashion travel handbag or functional weekender tote bag. Trust us, you will feel like you are carrying the Ruvalino as a chic designer tote more than a baby bag, and what's better when the dads are happy to be seen in public with it, too? 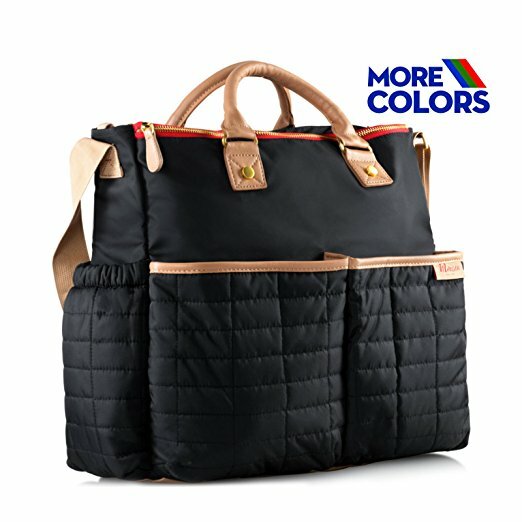 For those looking for a simple black no fuss diaper bag (you know, since it's for the boys), the Maman Diaper Bag is your best choice. 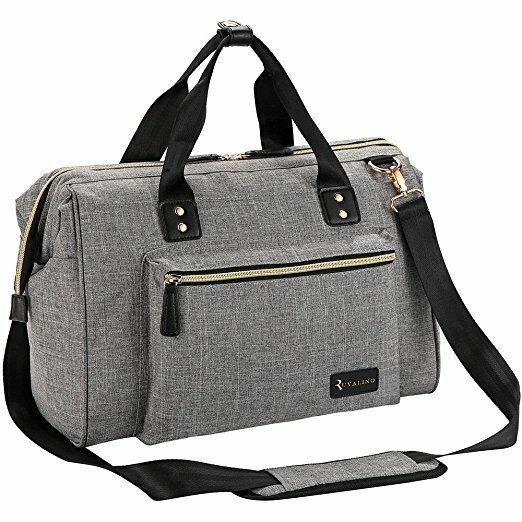 This may not be a popular brand (yet), but trust us, it is definitely one of the most raved diaper bag among parents who are genuinely surprised at its very high quality, especially its exclusive waterproof wipe-clean material that can handle anything from small sticky hands to big bottle spills. Featuring 10 pockets, the main compartment and front pocket are both zippable to keep your contents secured. What's worth mentioning is the 2 external magnetic front pockets that allow quick access to must-have items (you know, when emergencies call, there's no time to unzip!) as well as the inclusive of 1 inside personal secure zip pocket for your money or valuables etc. It also includes a changing pad that can be neatly stashed in the back pocket and universal stroller straps that clip onto every carriage, so there's no need to worry about finding other alternatives to secure it to your stroller. As a small family-owned business, customer satisfaction is the brand's top priority so you can be assured you will really get the top quality of what you pay for - confident enough for Maman to offer 100% money back guarantee. For those waiting on backpack diaper bags for boys, Bag Nation Diaper Bag Backpack is the one for you. This diaper bag backpack comes in low-key black which at one glance, looks like an ordinary backpack no one will suspect otherwise. However, it's packed with 14 different pockets and compartments inside so you can organise your supplies with ease. There surely is one for every need! It also comes with 1 large durable changing mat as well as 1 sundry bag, and is in this low-key black which at one glance, looks like an ordinary backpack no one will suspect otherwise. In terms of material, it utilises high quality water resistant twill polyester that is stronger than cloth with strong zippers so you can be sure there is no fraying stitching. This is one backpack that will surely lasts for years. 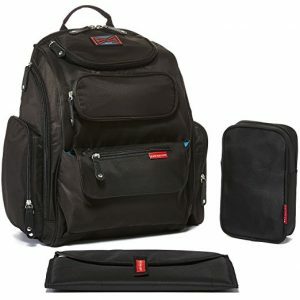 Aside from the Bag Nation Diaper Bag Backpack, there are a few other excellent backpack options as well which are fitting for both genders (see our separate review on them here), including the very popular HaloVa Diaper Bag, so hurry up and don't miss out! When it comes to twins, size or capacity is the key factor in choosing the best diaper bag for yourself. While most diaper bags in the market are of a good size, we found 2 extra large diaper bags that will surely fit your double essentials, there's no need to take two bags out each time anymore! 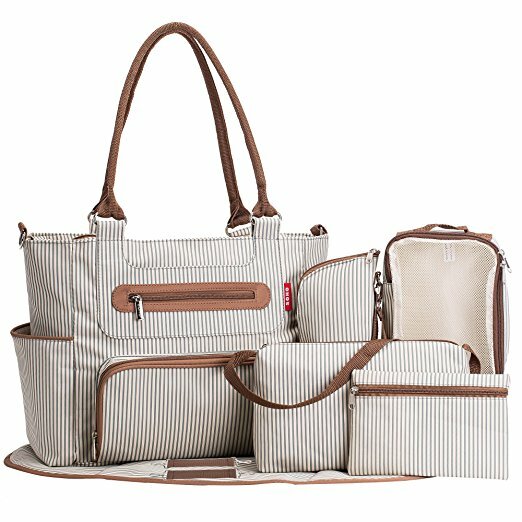 As you can probably tell from its name, the Skip Hop Baby Grand Central Take-it-All Diaper Bag is certainly one that lets you take them all! 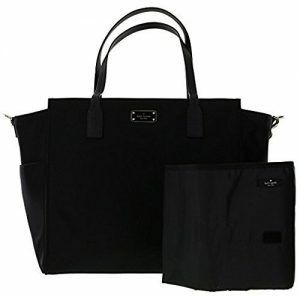 It may not look like it, but the Grand Central diaper tote magically combines a compact modern style with an uncanny ability to hold more than you can imagine. Boasting a length of 18 inches (for reference, most diaper bags range from 13 to 16 inches), this bag is divided into 3 large sections with 11 pockets, with the two front pockets and main section equipped with zip top closure. The baby section includes clear, wipe-clean zip pocket and toy loop while mommy's section has a zip pocket, phone pocket and fleece-lined sunglass pocket. All lining is water resistant and everything is BPA and phthalate free. Comes with a cushioned changing pad as well, you can easily change your twins anytime, anywhere. 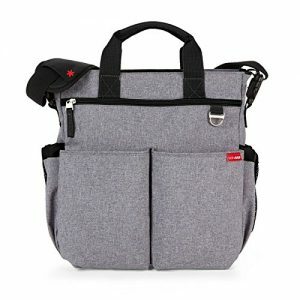 Overall, the Skip Hop Baby Grand Central Take-it-All Diaper Bag is a good choice for those looking for a diaper bag for your twins, instead of having to bring two bags every time. Another popular choice for twins is this Diaper Bag by Hip Cub, boasting a grand 19 inches in width in total! Made from durable materials so that it is built to last, the exterior cotton canvas is super easy to spot clean and the interior is a wipeable polyester. This is especially important because with twins, you know it's double the messiness so an easy to clean diaper bag is a must! There are 9 secure pockets built in this diaper bag for you to compartmentalised your essentials, with the back pocket equipped with zipper to keep 'messy things' separate. 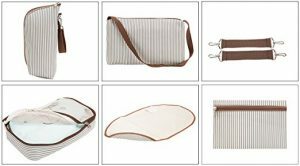 Like all good diaper bags, the Hip Cub Diaper Bag comes with universal stroller straps to allow you to convert your baby bag into a stroller organiser, in addition to an adorable matching striped portable changing pad. This is truly one big diaper bag that will carry all your essentials, otherwise, the brand provides you a 90-day 100% money back guarantee! Used by even the royals, the Ju-Ju-Be Legacy Collection B.F.F Convertible Diaper Bag is one designer diaper bag that you can be sure of in terms of high quality. The bag's lining is protected with Agion natural antimicrobial treatment, which inhibits and reduces the growth of odor-causing bacteria, mold and mildew. 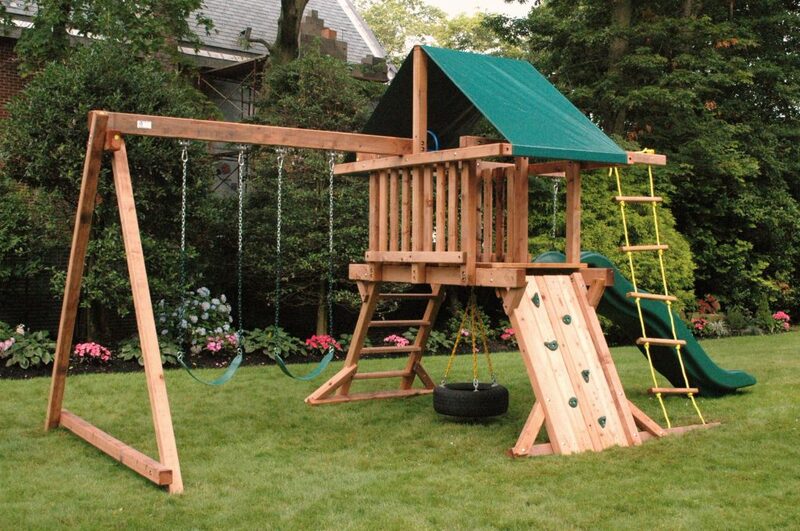 The outer fabric is treated with Teflon fabric protector, so you can repel stains and keep it clean. In terms of pockets, this one has 10 in total - the front "mommy" zippered pocket for smartphones, wallets, keys attach to the key fob stretch cord, and other personal items, while the inside organization includes 4 gusseted pockets, 3 zippered pockets and lots of wide open space! The main zippered pocket is large enough for diapers, wipes, extra clothes and other items and the back pocket is designed with crumb drains to keep this area clean. Bottle pockets are located on either side of the bag and come insulated with Thinsulate by 3M to keep your items hot or cold. Oh, it also includes a super cushy matching memory foam changing pad. Designed with convenience and comfort in mind, this versatile bag offers multiple carrying and storage options to help you stay organised - carried using its top handle, over-the-shoulder strap or backpack straps. 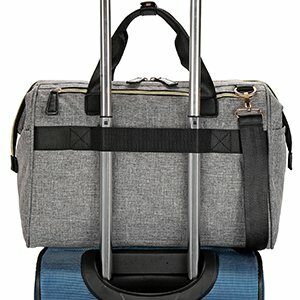 The memory foam straps will prevent the bag from slipping off your shoulder, thanks to the textured fabric underneath, while the included luggage feet helps keep the bottom of your bag clean when you set it down. 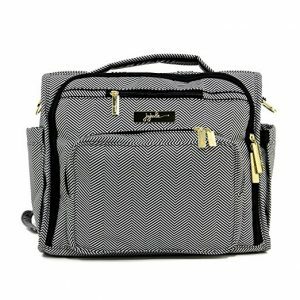 The Ju-Ju-Be Bag Legacy Collection B.F.F Convertible Diaper Bag is one of the most loved designer diaper bags for boys because of its chic, unisex design. They are so popular, there are many imitations in the market which compromise on quality so be sure to get from an authorised dealer as all authentic Ju-Ju-Be bags come with a Lifetime Limited Warranty against manufacturing defects. So make sure you do check first before making your purchase! Last but not least, we chose this - the Kate Spade New York Blake Avenue Kaylie Baby Diaper Bag for those looking for designer diaper bags for girls. 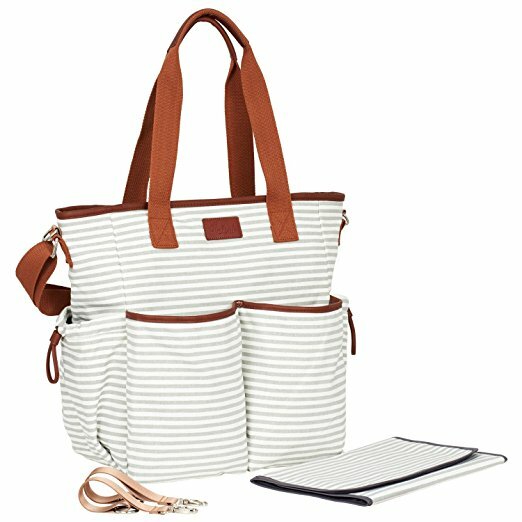 This is another one of those unassuming diaper bag which at one glance, wouldn't be able to even tell it is a diaper bag! This is perfect for the stylish and chic moms who want to stay trendy without compromising on functionality. 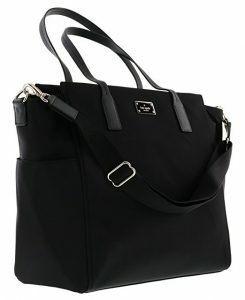 This designer tote bag has two ways of carrying - shoulder or cross-body. What's great about this bag is that it may look thinner and smaller than many diaper bags, however, it is actually 18 inches in width which makes it one of the roomiest diaper bag in the market. 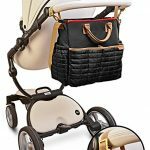 As to be expected from the designer, the stroller connecter of the bag is made with gold leash clasp and the elastic changing pad holder (with black changing pad inside) is Kate Spade embossed. The adjustable and removable cross body/shoulder strap is made of thick, durable material that will not dig into your skin. 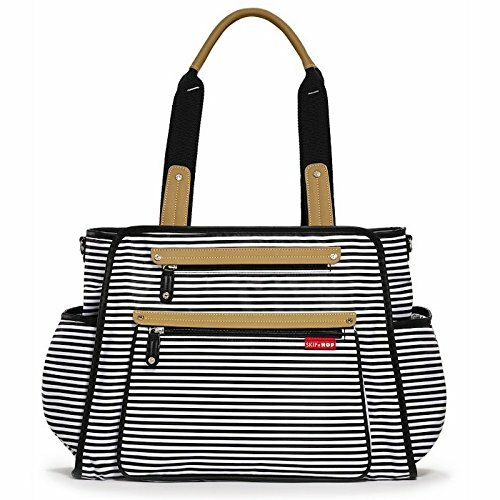 Given its stylish design, once your little one has outgrown the use of a diaper bag, you can still use the Kate Spade New York Blake Avenue Kaylie Baby Diaper Bag as your everyday go-to bag (psst, many love it as a travel bag!) so really, it is one diaper bag that is worth the investment!